ONE STOP SHOP FOR ALL YOUR BEAUTY NEEDS! Thinking about getting waxed? Don't know where to start? Check out our Dos and Don'ts that will help you prepare your our amazing service! We are available to answer more questions and help you make the right choice based on your preferences and needs. At LSS, our goal is to pamper you from head to toe and bring out your individual natural beauty. A traditional manicure that includes a deeper exfoliation, a mask, more intensive massage and a soothing warm, moist wrap. Includes soaking, light exfoliation, cuticle treatment, massage and nail polish. Our stylists attend training sessions every year at the LOreal Academy in New York to keep abreast of the latest in styles and trends, and they are committed to bringing these innovative and advanced techniques they learn to you! 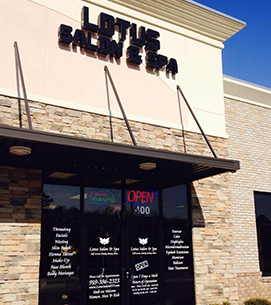 Lotus Salon & Spa welcomes you to experience the best services at reasonable prices. 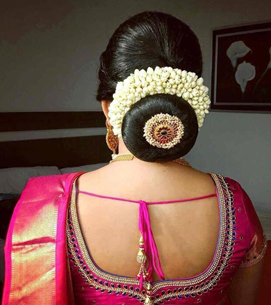 Lotus is the place where style & Beauty is created & it provides you all beauty and hair services. 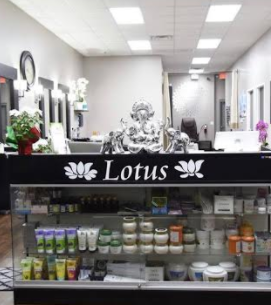 Lotus Salon wants you to achieve professional results . 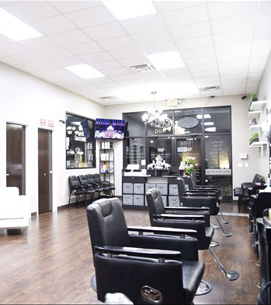 We offer a full range of professional beauty services which includes Threading, Waxing, Facials, Bodyscrubs, Manicure and pedicure & Hair Services . Our goal is straight forward, to find the highest quality beauty services and offer them at the best possible prices. 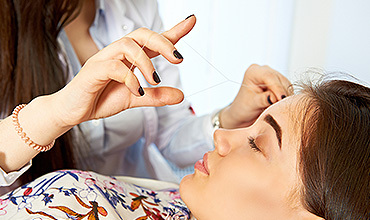 Please Check out our monthly promotions, Signature Packages and visit us soon..
Threading is an ancient method of hair removal which originated in parts of India,the Middle and Far East, and is now gaining popularity in Western countries. Our waxing services are widely popular in the RTP community because of our caring and professional approach and we only use the highest quality hard and soft waxes. No Double Dipping!! Our stylists attend training sessions every year at the LOreal Academy in New York to keep abreast of the latest in styles and trends, and they are committed to bringing quality services to you! At LSS, our goal is to pamper you from head to toe and bring out your individual natural beauty. Our experienced and talented stylists and staff members are among the qualified in the industry. Full body scrub to exfoliate dead skin cells to leave soft healthy skin behind. 75 minutes and $80 of services. Lotus has wide range of offers and discounts available for you on various services. Please checkout our specials page for further details. We are committed to excellent service for everyone that walks through our doors. Lotus Salon & Spa © 2018 All Rights Reserved.